The M&P40 2.0 from Smith & Wesson is the perfect pistol for those who want power and capability in the same package. This pistol was designed to bring the powerful punch of the 40 S&W round into a pistol that is equally at home on a policeman’s belt or in a S&W M&P40 M2.0 concealment holster. This ergonomic power house of a pistol is capable and durable enough to be passed down for generations. This second generation version from S&W carried over everything great about the original but added even better ergonomics and a re-worked trigger that is among the best in the industry. that wasn’t designed to bring the grip of your pistol in all the way against your body. It’s not hard to hide this large pistol in a Clinger Holster because our holsters are designed specifically to bring the grip of your weapon in all the way until it is up against your side. The secret to concealing a pistol this large is to get the grip pulled in tight. After all, if the grip is pulled in all the way, it won’t protrude (or “print”) through the back of your shirt. If you are looking for a M&P40 2.0 OWB holster, we’ve got the perfect holster for you whether you intend to conceal your handgun or carry in an open carry holster. 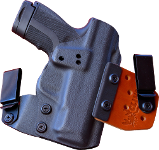 Our Ultra-Conceal OWB holster is designed to pull the grip of your weapon in close to your body. This is something you just won’t see in the competition’s OWB rigs. The competition’s rigs tend to lean away from the body. While that works ok for open carry, it just doesn’t work for concealed carry. Plus, even if you’re carrying openly, having your pistol closer to your body means it’ll be more comfortable in your car. You won’t bump your nice pistol into as many walls or furniture either. Clinger also makes a great S&W M&P40 M2.0 holster for IWB. The No Print Wonder conceals better than any holster you’ve tried and it tuckable as well. No matter which holster style you prefer to use with this great S&W pistol, Clinger Holsters has exactly what you need.